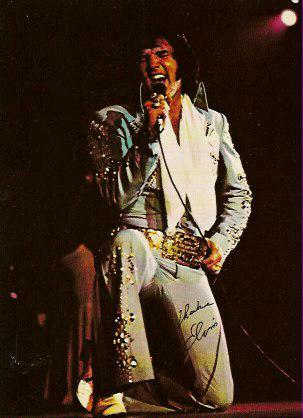 Elvis in August—Starting with his triumphant return to live performances at the International Hotel in 1969, August was Elvis month in Las Vegas through 1975. His followers came by the thousands in the summer to see Elvis on stage in the desert. Those engagements at the International and Hilton were particularly popular among his European fans, who came to Las Vegas in organized tour groups. 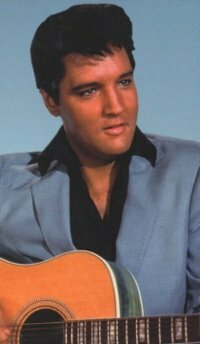 During the 1960s, August often found Elvis performing for Hollywooalohd cameras. Principal photography on four of his films began in August. The month was also a sad one for Elvis and his fans. Both Elvis and his mother died during the month of August. August 1, 1955 — Elvis appeared at the Tupelo Fairgrounds. It was his first professional show in his hometown. August 15, 1955 — The first managerial contract linking Elvis and Colonel Parker was signed by both men. August 22, 1956 — Principal photography began on Elvis’s first movie, Love Me Tender, on 20th Century Fox’s lot in Hollywood. August 24, 1956 — Elvis recorded the song “Love Me Tender” in Hollywood. August 31, 1957 — Elvis performed a controversial concert at Empire Stadium in Vancouver, B.C. It was Elvis’s last concert outside of the U.S.
August 14, 1958 —Elvis’s mother, Gladys, died in Memphis. August 16, 1960 — Principal photography on Elvis’s sixth movie, Flaming Star, began at the Conejo Movie Ranch in Thousand Oaks, CA. August 29, 1962 — Kid Galahad, Elvis’s tenth film, opened nationwide. August 7, 1965 — Principal photography began on Paradise, Hawaiian Style, Elvis’s 21st movie. August 27, 1965 — The Beatles came for an evening visit with Elvis at his Perugia Way home in California. 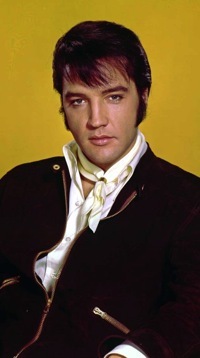 August 16, 1977 — Elvis Presley died in Memphis at the age of 42. Elvis received his draft notice from the Memphis Draft Board in December 1957 and was inducted into the army in March 1958. At nearly all of his press conferences in 1957, the 22-year-old Elvis expressed his readiness to serve in the military when he was called. His statements then included a willingness to perform any job the army might assign him. In August 1956, however, Elvis was making it very clear that going into the army was high on his least of least favorite things. When asked about his draft status at an August 7 press conference in St. Petersburg, Florida, Elvis admitted, “I’m draft bait.” Although he had registered with the Memphis draft board, Elvis said, “I haven’t heard from them in three years and I hope I never do.” When reporters pressed him on possible military service, Elvis was philosophical about it. “If it comes, it comes,” he said, adding that he had no preference for any particular branch of service. In the meantime, however, he made it clear he had no plans to enlist voluntarily. Either Elvis underwent a patriotic epiphany about military service in 1957, or he and Colonel Parker decided it was best for his public image for him to appear willing to serve his country. With his August 1969 run at the International Hotel in Las Vegas, Elvis initiated a new era in his storied career. Variety gushed with praise in it’s review of Elvis’s return to live performing. The publication’s reviews of Elvis’s Vegas engagements through the coming years were generally positive. However, six years later, when Elvis’s August 1975 engagement at the Las Vegas Hilton turned disastrous, Variety’s writers had to admit there was something wrong with Elvis. Scrambling to keep its showroom open, the Hilton immediately brought Peggy Lee over from her opening night at the Flamingo Hilton to take Elvis spot in the larger showroom for several nights. Lee went back to the Flamingo, when Bill Cosby, who was due to follow Elvis at the Hilton on September 2, agreed to come in a week early. Roy Clark was brought in as Cosby’s supporting act until September 2, when Clark was replaced by Manhattan Transfer, Cosby’s originally scheduled opening act. Meanwhile, in addition to his contract breach with the Hilton, Elvis had another problem in Las Vegas that August. Variety reported that a California woman had filed a lawsuit against Elvis, alleging that he had broken her ankle during a Karate display in Presley’s Las Vegas suite on August 19, 1973. According to the suit, the woman was allowed to lock Elvis in a full nelson hold. To break the hold, he kicked her in the ankle, which allegedly “resulted in a snapped bone and extensive medical bills.” Beverly Albreco asked for damages exceeding $10,000 in the suit. August 3 — Gordon Stoker of the Jordanaires was born in 1924.He died on March 27, 2013. August 7 — Marlyn Mason, Elvis’s co-star in The Trouble With Girls, was born in 1940. August 8 — Larry Geller, Elvis’s friend and spiritual adviser, was born in 1940. August 10 — Kathy Westmoreland, background singer for Elvis during the concert years of the 1970s, was born in 1945. August 11 — Laurel Goodwin, Elvis’s co-star in Girls! Girls! Girls!, was born in 1942. August 12 — Roy Bennett, co-writer of 43 Elvis tunes, including “G.I. Blues” and “Puppet on a String,” was born in 1918. August 12 — Deborah Walley, Elvis’s co-star in Spinout, was born in 1943. She died in 2001. August 19 — Debra Paget, Elvis’s co-star in Love Me Tender, was born in 1933. August 21 — James Burton, Elvis’s guitar player, was born in 1939. August 23 — Barbara Eden, Elvis’s co-star in Flaming Star, was born in 1934. August 24 — Arthur (“Big Boy”) Crudup, writer of Elvis’s first recording, “That’s All Right, Mama,” was born in 1905. He died in 1974. August 27 — Tuesday Weld, Elvis's costar in Wild in the Country, was born in 1943.